Socialist Alternative encourages everyone to support the united action of North American tribes to prevent the building of the Dakota Access Pipeline (DAPL). Millions around the country and the world want to take a stand. We have built solidarity meetings in a number of cities, raised money and sent representatives to Standing Rock. But now is the time for escalating solidarity protests around the country. Last week a police force backed by corporate paramilitary agents and armored vehicles moved against indigenous people and other activists courageously protesting the Dakota Access Pipeline. Activists were beaten, maced, pepper-sprayed, shot with rubber bullets and threatened with automatic weapons. At a time when scientists say that even the Paris Climate Accord is woefully inadequate to keep the warming of the planet to under 2 degrees Celsius, this struggle highlights the need to escalate our fight against climate change and link it to a struggle against a system that not only destroys our environment, but also rests on the oppression of native people, people of color, and the exploitation of workers. The 1,134-mile pipeline would transport 470,000 barrels of crude oil from the Bakken oil field in North Dakota to a refinery near Chicago. Central to this struggle is the decision to route the pipeline upstream of the Missouri River, the major water supply for the Standing Rock Sioux Tribe. With over 2,000 pipeline ruptures and spills in the last ten years, there is very real fear of major pollution with detrimental effects on health for Standing Rock Sioux tribal members, as well as the millions of people who rely on the river for drinking water. The decision to re-route the pipeline away from a white neighborhood further North when they protested it, and the brutal attacks on the encampments, demonstrate the racist character of this whole project and the state forces promoting it. 350.org co-founder Bill McKibben has stated that the encampment on the Standing Rock Sioux reservation, where representatives of more than 200 tribes have come together, as “the most dramatic show of force of this environmental movement”. This show of strength by the tribes follows the recent “Idle No More” indigenous movement in Canada, which won victories against pipelines and helped to inspire the successful West Coast struggle to block six coal export terminals. The issue of preserving land and water is central to indigenous peoples, having been brutally driven off their original tribal lands by US authorities in the past. Republicans are funded to the hilt by oil money. But so are the Democrats, and it was the Obama administration which oversaw the largest increase in oil extraction in a generation and whose State Department pushed fracking globally. Under pressure from the growing movement and the violent removal and arrest of protesters on October 29, Hillary finally broke her silence in a statement that Bill McKibben described as saying “Literally nothing.” Her statements effectively supported the status quo of allowing state forces to remove protesters. President Obama, despite making some positive statements about a possible federal review, has refused so far to condemn these violent attacks on protesters, or use his powers as president to stop the pipeline. As president, he can assert treaty rights for the land at Standing Rock; according to the 1851 Treaty of Ft. Laramie these are sovereign lands under the control of the Oceti Sakowin peoples. This could immediately stop all actions by companies and state officials in Dakota. It can’t be excluded that, under mounting pressure, Obama could be forced to re-route the pipeline which would be a victory for the protesters. It would cost the companies a lot of money but the pipeline could be completed. However, there should be no faith in the Obama administration even going this far without sustained and escalating protests. In contrast to Clinton and Obama who try to straddle the fence between corporations and native people, Kshama Sawant, city councilor in Seattle, and a Socialist Alternative member, recently stated: “A month and a half ago, with the leadership of indigenous activists who spearheaded the introduction of Indigenous Peoples’ Day in 2014, I brought forward a resolution in the Seattle City Council calling for solidarity with Standing Rock. The statement, which condemned past violence and called on North Dakota authorities to drop all charges against protesters and journalists, was passed unanimously. But our demands and the voices of so many others in the U.S. and internationally have gone unheeded.” Imagine how much more powerful our movements would be if we had more representatives like Kshama Sawant who unapologetically stood on the side of the 99% and used their positions to build and strengthen our movements. 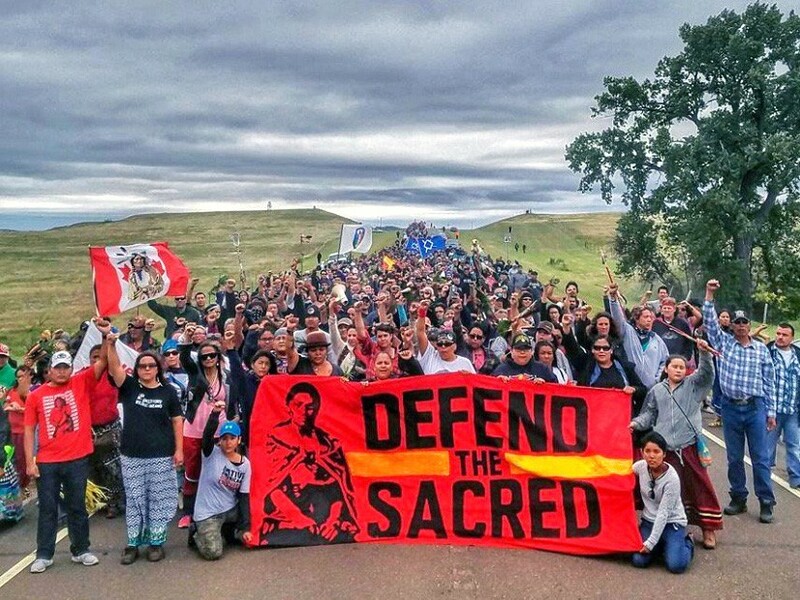 The powerful demonstration of solidarity and strength by the tribes has tapped into the increasingly urgent desire for real effective action against unchecked corporate power by millions across the country. Having seen politicians from both parties fail to take any meaningful action on climate change, the fight at Standing Rock is helping propel the movement towards adopting a strategy of mass direct action and mass protests . Already, over one million people have virtually checked into Standing Rock to prevent authorities using online presence to target activists joining the protest on the ground. Also over $3 million dollars have been raised to support protestors and provide bail money for those arrested. Native people have been on the frontlines of struggles against oil and gas polluters. Their determination to struggle is linked to their understanding of the critical importance of protecting natural resources including their land and water. We need to defend the rights of Native Americans to decide on issues that affect their lives, their land and their future. Their determination and their willingness to escalate this battle has inspired millions across the world, and shows the potential to bring in a wider layer of people to active struggle. We need to organize escalating protests outside these banks. We need to protest state authorities who send police to do the bidding of pipeline companies and arrest protesters. We need to build powerful protests on college campuses. We need to link the pipeline protest to other urgent issues. By supporting each others struggles we can build a powerful movement to fight all injustices. However, the main national labor federation, the AFL-CIO, is scandalously supporting the pipeline project. Under pressure from the building trade unions, they are taking a narrow view of support for pipeline jobs over the broader issues of this struggle. We call on the AFL-CIO to reverse their position. He also explained how the 2014 and 2016 national conventions of the APWU passed resolutions calling for “expanded energy projects and for a just transition from jobs based on fossil fuels to ‘green’ jobs.” Dimondstein explained that, “These resolutions mandated the APWU leaders to participate in coalitions that fight environmental justice and work towards mitigation of the effects of climate change”. The role labor could be playing in these and similar struggles is based on their tremendous resources which could be directed at building the struggle as well as educating their workers. In addition, they have the most potent weapon of all in the battle between workers and corporations, the power to withdraw their labor, for example by refusing to deliver materials going into the site. We need to link the legitimate concern of workers about the need for good jobs with urgent action on climate change. A clear call for a powerful green jobs program, with retraining for those whose jobs are phased out, as a just transition from fossil fuels to green jobs is a critical part of building this struggle. We also need policies that address the power of the fossil fuel industry and the major banks that fund them. Bank of America, Wells Fargo and many more are complicit in climate destruction. We call foror democratic control over investment decisions harming the rights of Native Americans, the environment and the living conditions of humans on this planet. This would mean taking the energy sector out the hands of the ruling elite who control these resources and exploit them for profit. They should be run under the democratic control and management of the 99%. This should be part of an emergency plan to tackle climate change, organize climate justice, and transition towards a socialist society. #NoDAPL: End the North Dakota Access Pipeline; stop oil trains running through cities and towns; ban fracking. Organize escalating protests at Standing Rock and in cities across the country. Climate Justice: End the age of fossil fuels, for a just transition for workers and communities disproportionately impacted by pollution and climate change – good jobs and clean, affordable energy for working people, backed by a massive investment program in sustainable energy production. End racism. Full rights to Native Americans to decide over their lives, land and future. Withdraw all National Guard troops, Sheriffs and police from the #NoDAPL protests and put a halt to the DAPL construction. Bank of America, Wells Fargo and many more are complicit in climate destruction. For democratic control over investment decisions harming the rights of Native Americans, the environment, the living conditions of humans on this planet. Take the major banks under public control and management. For an emergency plan to tackle climate change, put the energy sector and companies under public ownership, and organize climate justice.